Completed "Drip Down" mural near Section 104 at the Hard Rock Stadium in Miami, FL. Organized and curated by Goldman Global Arts. Ultimate Ears announces the first artist edition UE ROLL 2 speaker, Drippy UE ROLL 2, designed by renowned American artist Jen Stark. Created to celebrate the relationship between movement and sound, the limited edition Drippy UE ROLL 2 was inspired by prismatic colors and nature. Fun new video interview inside my Chinatown studio in Los Angeles by Amadeus Magazine. Directed by Matthew Kaundart. See the full video below. 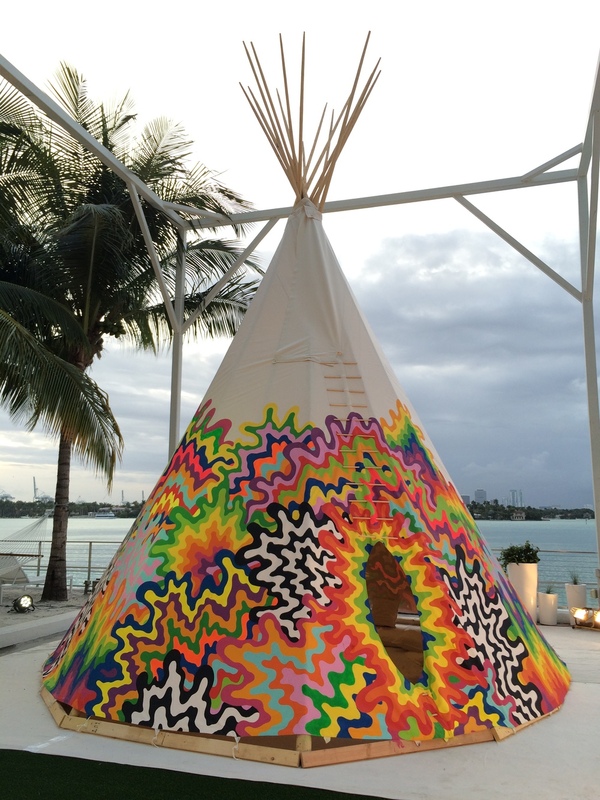 "Jen Stark’s Colors of Consciousness"
Miami-born, LA-based contemporary artist Jen Stark burst into popularity through her recent collaboration with Miley Cyrus and Wayne Coyne on the music video “Lighter.” Working with ecstatic color palettes, there’s a galvanizing subtext of psychedelic shamanism and dimensional of consciousness interwoven through every piece. Articulating her style by layering colored paper in repetition, she turns two-dimensional material into three-dimensional sculptures. It’s an artform Jen fell into by happenstance during a brief semester abroad in the south of France, when construction paper was all she could afford. Fueled by a love and deep fulfilment from the process, Stark continued into what is now a very successful career, with major solo exhibits across North America. With boundless curiosity and a sense of wonder for the intangible, Stark offers an eloquent opinion on art as a method of meditation and on finding balance as a modern-day artist. On transcendence through art. For me, the act and process of creating art is just as important as the final product. My art practice is very meditative and brings me to a trance-like state when I’m creating – especially with very repetitive tasks. Art is an expression of my inner fantasies, dreams and thoughts. Creating art pushes me to brainstorm and challenge myself, which is very therapeutic and helps me understand myself better. With much of my work, I’m diving into questions about the universe and consciousness and trying to understand what it is all about and why it exists. I’m trying to reach that transcendental state through artwork. For Jen, nature inspires. Much of my work is inspired by the natural world. In nature, color is a way to get someone’s attention – from a poisonous frog warning a predator off with its vibrant color patterns, to a ripe, red berry ready to be eaten. To me, color brings a sense of awe and wonder. I’ve always had a deep fascination for nature and how it relates to science and spirituality. I feel there is a parallel between different shapes within our universe: like how the Fibonacci spiral equation relates to so many things in nature – from the shape of shell to how a fern unfurls. Sacred geometry is a big inspiration in my work. Lately, the psychedelic world and the mysteries of consciousness are things that have been most prevalent in my work and thoughts. Through my work, I’m trying to create a bridge between all these magical things, and hopefully, make a great discovery or inspire others. On her process. Typically, I sit down at my studio desk and begin sketching ideas in my sketchbook. I write down lots of words in addition to images. Then, once I pin down a favorite idea, I’ll begin to create it. If it is a paper sculpture, I’ll cut each layer out by hand with an exacto knife and sequentially put it together. If it is a painting, I’ll hand-sketch the lines with a pencil, then mark what each color should be with a tiny dot. Then, I’ll have assistants help me color them in. Much of my work is very labor-intensive, so process is a big part of it. On the career of a modern day artist. Today’s art world seems very different than it used to be. Artists can have more freedom now and write their own rules. The internet definitely helps by connecting people to each other. I balance both the art and business side and realize both are important to keep growing and being able to do exactly what I want to do. I think it’s important to be able to fund the work but not create work that is purely a commodity. I think it’s important to create great work that challenges and inspires. As long as I am creating work that I believe in and am inspired by, I feel like others will see its importance and the business side will in turn follow. On gaining popularity. Working with Miley Cyrus was a fun cosmic coincidence. I had met her one night through my friend Wayne Coyne (Flaming Lips), and a couple of days later, MTV was pitching my work to her for the VMAs. It felt like it was meant to be and was a good psychedelic match. She has a very creative vision and is a free spirit who speaks her mind and knows what she wants. That project was surreal and really helped my art grow and think outside of the box. I’ve had a lot more eyes on my work because of that exposure, which has been amazing. LISA SOLBERG: You just did a project for The Standard called “Radiate.” What inspired it and how did the idea come about? JEN STARK: The Standard contacted me because they wanted to do something to commemorate all of the progress the LGBT community has made. Since my work is very colorful and rainbow, they thought it could be an amazing match. We decided to do a flag on their rooftop. I called it “Radiate” because my work has a lot of energy in it and seems to propel forward. It radiates like the sun. Yes, exactly. It’s kind of a simple design—it’s like my work minimized to the very core. I wanted to help empower that community. It’s this perfect, beautiful storm that worked out amazingly. Was that your first time your work has been tied to the LGBT community? The wormhole that you did for Miley Cyrus’ MTV Video Awards was so cool. How did that collaboration come together? So she had already put it together for you? Yes, and it was still a big secret that she was hosting the award show. Coincidentally, MTV presented her with my work about three days after we met. They told her, “This artist is cool. She’s psychedelic. We think she could be a perfect fit.” And Miley was like, “Whoa, that’s crazy—I just met her.” So after that I was onboard. Miley is so cool. She’s very free and does her own thing. She’s a very psychedelic person, too. What does it mean to be a psychedelic person? She just does what she wants. That’s definitely a difficult thing for a lot of people to do. Miley is a very pronounced feminist and such a strong female icon. How do you relate to feminism, if at all? I think I am a feminist. I’ve never labeled myself as one. I don’t really like labeling myself, but I think I am. The older I get, the more feminist I become by just empowering women and trying to make things more equal in the world. Maybe it’s realizing what an impact you have on so many other females. That’s what it’s all about—inspiring other people, and inspiring young women, that’s amazing. Young women and girls are seeing what another woman can achieve, and I think that’s incredible. Would you say that your artwork is emotional or spiritual for you? I wouldn’t say it’s emotional because once I make it I’m not really attached to it like a lot of other artists. I just get it out in the world and I want other people to see it. I would say it’s more spiritual and meditative. It’s more about the process of brainstorming and coming up with the ideas. That’s the fun part for me. Psychedelia, consciousness, where we came from, mysteries of the universe—I plant all of those ideas in my work. You produce a ton of work, and it’s obvious that it would be impossible for you to do that all on your own. In order to execute big ideas I think it’s good to have help. In the beginning of my art practice, I was hesitant to bring other people into it because I was controlling. I didn’t want it to suffer from other people’s help. But it’s been the opposite. Other people’s help has been amazing and has helped me grow. My work still has my hands in it. I’ll always make sure the backbone of it has me, and I’ll always work on the pieces, too. When you’re constructing a project, do you have a layout for it? Well, for the drip pattern, for instance, I’ll actually draw all of the lines by hand, and others color them in. With paper sculptures, I’ll do the cutting myself because it’s kind of impossible for someone else to do that part—it would look like their hand. But then I’ll have help putting it together when it comes to the tedious stuff, like the in-between layers that you don’t see, or the gluing. Do you feel free in the iconic Jen Stark aesthetic system? Your style has evolved, but it’s very Jen Stark. I definitely feel free in that. It’s amazing to be able to have my own style and to have it evolve and have people recognize that. I guess my main styles would be the paper sculptures, the intricate cutting designs, and the dripping, but I do like to keep pushing and challenging myself. I will definitely keep evolving. I wouldn’t want to do the same thing over and over my whole life. In one of your past interviews, you said that accessibility is really important to you. I would love to keep doing more public art because I think that’s the most powerful, and people don’t have to go into a gallery or a museum to view it. I would like to keep pushing that and also do some really huge outdoor public sculptures that incorporate some kind of renewable energy. Do you mix your colors, or are they straight out of the bottle? With my rainbow schemes, I’ll usually mix because it’s hard to get the perfect color. But with a lot of the random colors, I’ll just try to use colors straight out of the bottle because it’s easy. As long as they’re opaque enough and I like the color it’s cool. Is there some sort of color theory, or do you just go with what you feel? I took color theory in college, so I absorbed all of that, but in my own way of choosing colors, it’s very instinctual. I’ll just know what colors to put next to each other. Usually it deals with contrasting, light and dark hues, stuff like that, but it’s pretty much just my brain deciding. I normally don’t have to think about it too hard. Do you ever get sick of color? No. I don’t use color everywhere in my life. Right now my bedroom is very white and clean with a lot of green plants. I don’t immerse myself in a crazy amount of color. I think it’s like a good balance. I haven’t gotten sick of it. I think about ADD and ADHD a lot because I find it really hard to sit down for more than ten minutes. What sort of methods do you use to stay focused? I’m sure you have to really stay put for long periods of time. I don’t have ADHD, which is good because I can focus a lot longer. I think I have a lot of self-discipline. I have a meditation practice that I’ve been doing for about a year. It helps to meditate twice a day—twenty minutes each time if I’m good. What’s coming up for you? I’m going to have a solo show in New York at the Eric Firestone Gallery this the fall. I’m also going to start making clothing. It’s in the very beginning stages, but in the next couple of months I’ll start coming out with some drippy outfits and stuff like that. It’s going to be through my website. I have a friend helping with the screenprinting, so I’ll have all of the artistic creative freedom and he is executing it. We’re thinking it will come out in the next couple of months. New interview in Flaunt magazine where I talk about art, mushrooms & octopus. Interview & photos by Dominoe Farris. Check it out HERE. Your use of wildly vibrant colors meshed with intricate patterns are quite psychedelic. What are some of the influences that have helped inspire your work? My work is inspired by so many different things from designs in nature, to fractals, mysteries of the universe, and patterns & ideas brought on by altered states. Lately I’ve been reading "Food of the Gods" by Terence McKenna, which talks about how the human brain may have evolved thanks to the help of psilocybin mushrooms, medicine plants and altered states of consciousness, which I find fascinating. Where do you see yourself in 5 months? I was going to ask 5 years but 5 months sounds more reasonable. Any new projects cooking? In 5 months I’ll be working on my solo NYC show for the fall, and possibly doing some traveling either to Mexico City or Istanbul. I’ll also come out with a clothing line by then, so keep a look out for that! Standard question: What is your spirit animal and why? It can also be another person (people are animals too). It’s funny my friend Meredith who is a healer and does a form of reiki calls me her spirit animal. I never realized people could be spirit animals, but it makes sense. My spirit animal would probably be an octopus because of their fluid motions, beautiful camouflage patterning and adaptability to different environments. I mainly just think they’re very cool and mysterious. Please describe what kind of environment you work best in. I imagine you work long hours yet you seem very peaceful and grounded. How do you maintain that balance? I work best in my studio when things are organized, no outside noise and lots of nice lighting. I do work long hours, but I also have a couple assistants which helps me greatly. I try to meditate twice a day and stay focused in my work practice. I work best when I’m not stressed out about anything, and my mind is allowed freedom to roam. When I have creative blocks, I’ll do something different to help get the inspiration flowing. Like walking around in nature, reading a good book, running or taking a bath. How has social media influenced your life? Social media has been incredible in exposing my artwork to a larger audience. I definitely embrace it and think social media plays a big factor in artist lives today. For me, it has been an amazing way of showing my artwork to viewers around the world, and especially people who might not have normal access to art museums and galleries. It’s incredible when people see my public murals or ￼sculptures online and want to share them with their own network of friends. Its a great feeling. What would your dream commission be and what would you want to make? What would your materials include? I’m talking about making artwork anywhere and/or for any person, dead or alive, with an obscene budget. My dream commission would definitely be a public sculpture in nature. I’d love to create a large scale sculpture that incorporates renewable energy and gives back energy to us, yet at the same time is an intriguing and beautiful object. It would be amazing to do this in a park or at a school (and that same energy would go directly into the school). I’d probably create it out of metal to withstand the elements. Just completed a large scale outdoor mural in Culver City, CA for Platform LA. The mural is located at 8850 Washington Blvd. Below is a video of the wormhole & dripping animation entrance I created for Miley Cyrus during the 2015 MTV VMA's. Here is a Channel 10 Miami News story about the artwork I created for the award show. Jen Stark has been invited to create original animations and artwork for the stage and promotional material of the 32nd MTV Video Music Awards, hosted by Miley Cyrus, which will air live on August 30, 2015. As the featured artist, Stark has reimagined the visual identity of the 32nd installment of the awards show with her unique asthetic. In an early teaser video for the show, a colorful wormhole acts as a tunnel for a floating space suit-clad Cyrus, the always entertaining Disney darling turned pop icon who brought twerking and tongue poking into the cultural mainstream. In other promotional materials, Cyrus poses playfully in front of Stark's dripping designs. Going beyond advertisement, Stark's monumental hand-painted billboard in Los Angeles of Cyrus licking a moonman on a meltdown background, act as temporary public artworks, showcasing the brilliant patterns and colors that Stark masterfully choreographs. Beginning this week, these videos will be playing on billboards in Time Square and Port Authority. For the polished precision of her animations for the show, Stark worked with David Lewandowski, director and animation artist known for his bizarrely humorous meme-prone videos. During the show itself, Stark’s work will be featured in an animated set design displayed on a massive LED screen of the artist’s trippy, drippy scheme which will open for Cyrus’ dramatic entrance: the hostess sliding onstage through a rainbow wormhole. Stark has also customized the MTV logo for the show’s broadcast, envisioning the iconic graphic as a candy-colored meltdown. Show airs Aug 30th at 9pm EST. A hand-painted billboard was created in Los Angeles located at the intersection of Hollywood & Vine. Dripping Animation to be used during the show. I created a special tear-away artwork cover for the July issue of Cosmopolitan Magazine. The artwork is a photo of a paper sculpture I created for "The Love Issue". I just finished an artist residency at The Surf Lodge in Montauk, NY. While there I created a large scale mural on the side of the bldg, as well as a solo show in their gallery space. Check out the videos and photos of the process below. My latest work will be in a group show at Eric Firestone Gallery this Saturday May 23rd. Artist Include: Nina Chanel Abney, Joa Baldinger, Sarah Braman, Julia Chiang, Judy Chicago, Evie Falci, Orly Genger, Maya Hayuk, Misaki Kawai, Maia Ruth Lee, Keiko Narahashi, Amanda Ross-Ho, Miriam Shapiro, Shinique Smith, Agathe Snow, Jen Stark, Jessica Stockholder, Despina Stokou, Vadis Turner, Wendy White, and Chloe Wise. The original 1972 Womanhouse project was organized by Judy Chicago and Miriam Schapiro, who founded the California Institute of the Arts (CalArts) Feminist Art Program. Womanhouse was conceived by a member of Chicago and Schapiro’s program staff, art historian Paula Harper, who The New York Times celebrated as “the first [of] art historians to bring a feminist perspective to the study of painting and sculpture.” By taking over and remodeling a deserted Hollywood mansion, the artists behind the original Womanhouse aimed to confront social issues through physical labor, while they learned how to renovate their dilapidated home. Chicago and Schapiro encouraged their students to step outside of constructed gender roles and challenge their identities as artists. The work collected in Womanhouse (2015) is inspired in part by Chicago and Schapiro’s commitment to dignifying material and labor within an art practice. Such as in Sarah Braman’s work, where medium gives rise to form as plexi and steel are combined with mundane objects to make new constructions that feel counterintuitive, yet remain translucent and light. Similarly, Agathe Snow uses industrial materials such as fiberglass, pegboard and steel resulting in refined works that speak of environmental and moral decay, giving new life to the factory-made materials she uses in her assemblages. I just completed a mural installation in the newly constructed Facebook building (designed by Frank Gehry). It is a 40,000-square-metre office building with "the largest open floor plan in the world" and is located just south of San Francisco in Menlo Park. The project was curated by the Facebook Artist in Residence Program. Piece by Piece: Building a Collection premieres a selection of more than 30 objects in a range of media by 26 national and international artists from the Kansas City–based collection of Christy and Bill Gautreaux. The exhibition results from an enriching collaboration with the collectors and reflects extensive curatorial research into their energizing and ever-evolving contemporary art collection for which we are profoundly grateful. It highlights a global perspective, including established and emerging artists from Africa, Afro-Caribbean regions, Europe, India, Latin America, and the United States. Meditations on process, pattern, and material emerge as a major thread connecting the works, anchoring the artists’ themes of abstraction, the body and gesture, race and politics, as well as landscape and geography. The exhibition presents a distinguished vision in the building and shaping of a unique collection. The Gautreauxes note that “Most of this work was collected one or two pieces at a time, often spontaneously,” acknowledging, “It is exciting to see it curated by the Kemper Museum into a cohesive exhibition.” It is our hope that this focus on artists’ engagement with material and process, elevating themes significant to their practice, will prompt continued dialogue with contemporary art at the Kemper Museum. Artists include: Sanford Biggers, McArthur Binion, Sarah Braman, Nick Cave, Nathaniel Donnett, Leonardo Drew, Andrew Erdos, Teresita Fernandez, Vibha Galhotra, Theaster Gates, Jeffrey Gibson, Michelle Grabner with Brad Killam, Hayv Kahraman, Glenn Kaino, Bharti Kher, Katrin Korfmann, Aimé Mpane, Vik Muniz, Toyin Odutola, Angel Otero, Mariana Palma, Ebony G. Patterson, Jen Stark, Mickalene Thomas, and Kara Walker. I just completed my latest mural, "Meltdown", a permanent installation at Miami International Airport. 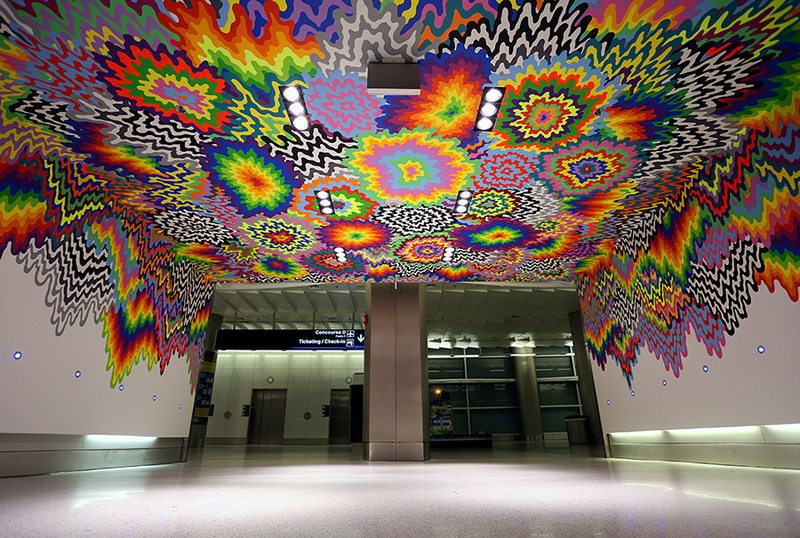 The mural is located between Terminal D&E on the 3rd level, just off the moving skywalk. 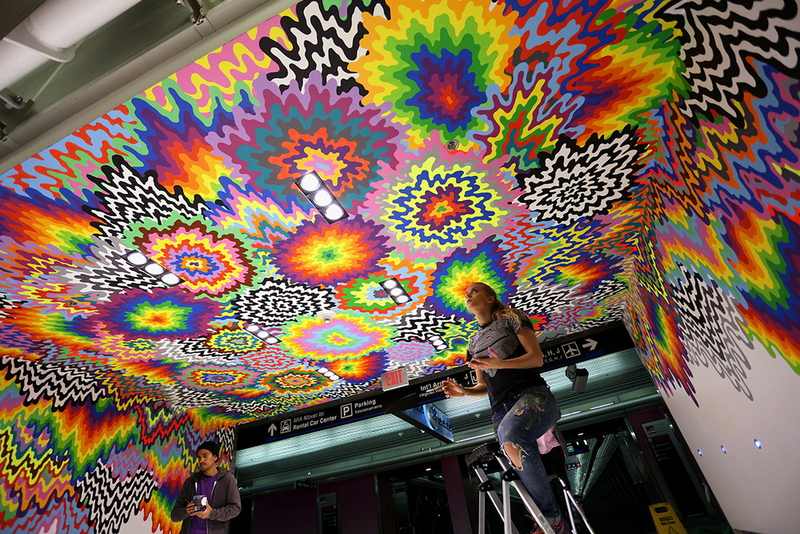 Check it out next time you pass through the Miami airport. Photos by Peter Vahan. 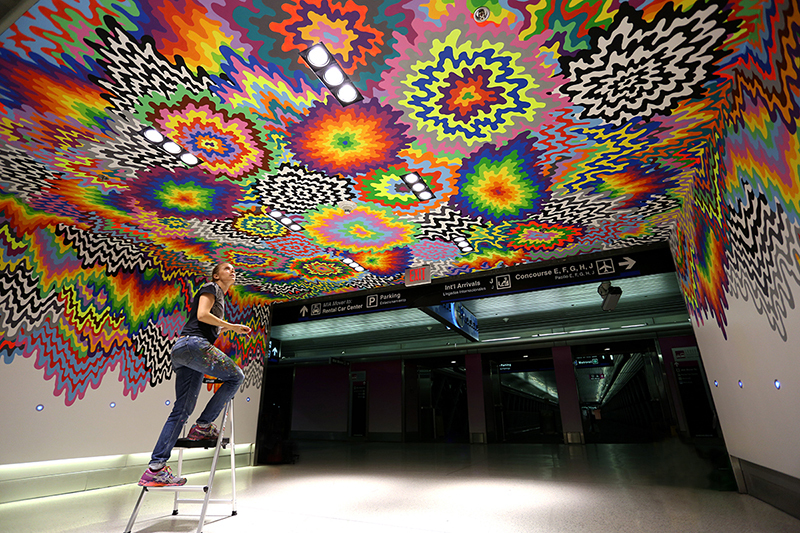 "Passengers at Miami International Airport can now have a colorful “meltdown” experience when they walk past Meltdown, a new, permanent art mural by Miami artist Jen Stark. 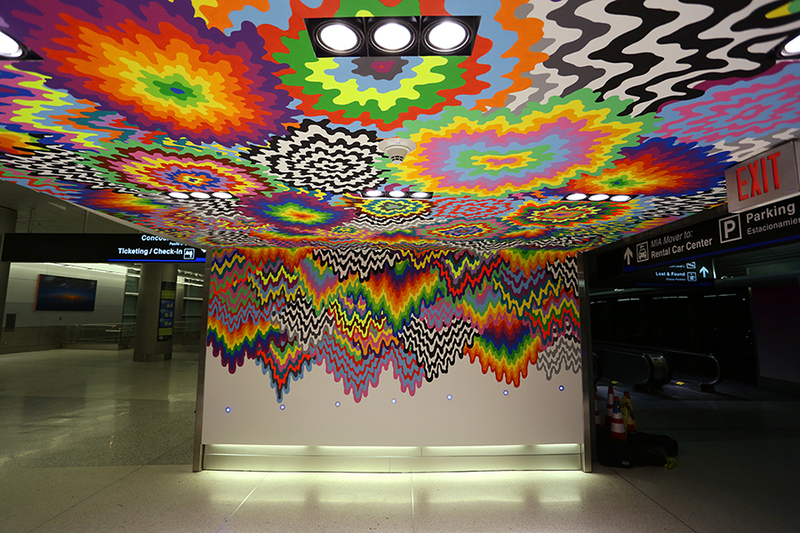 Meltdown greets visitors to MIA with a cascade of color and patterns when they enter the airport’s North Terminal on the third floor from the parking garage or the MIA Mover station. Meltdown is Stark’s latest project and expands on her previous work of creating complex colorful sculptures from paper and other media. Her work frequently explores ideas of replication and infinity, echoing the patterns and intelligent designs found in nature."